The early May Day bank holiday weekend saw the 43rd English National Surfing Championships. Spectators were treated to a smorgasbord of traditional and progressive surfing styles by surfers of all ages; from seasoned veterans to the rising stars of the under 12’s, all competing for the highest titles in English surfing. Jobe Harriss took the title of English National Champion and there were double celebrations across the womens events with Emilie Currie winning the Ladies Open and the Ladies longboard and coming fourth in the under 18 girls. Ellie Turner won the girls under 18’s and under 16’s and came second in the under 14’s. Quite and achievement! The event was jointly managed by students from Cornwall College’s FdSc Surf Science and Technology course in conjunction with the English Surfing Federation (ESF), the competition marked the opening of the 2015 competitive surfing season and is the first stop on the UK Pro Surf Tour Circuit. On Saturday Stanley Norman took the win in the under 12’s open final and Lily Mandeville to became the under 14’s girls champion. Ellie Turner stormed through some choppy surf to win the Zumba under 18 girl’s category with a wave score of 8.5, as well as the Boneyard Under 16 girls competition. Jack Unsworth dominated the Junior Longboard final to win with a final score of 13.2 and Emily Currie continued her campaign by winning her first Women’s Longboard title in two years, gaining a wave score almost double that of her fellow competitors. The weekend’s rain finally relented in time for Monday’s Semi’s and Finals of this year’s competition. The rain lifted and a solid 4-6ft swell was rolling in by the afternoon, providing the competitors with larger and cleaner wave faces to shred. Adam ‘Bearman’ Griffiths successfully defended his title as Longboard Champion against the formidable talents of semi-final winner, Ben ‘Skindog’ Skinner, Sam Bleakley and Ben Haworth in 6ft surf that saw Skindog’s board snapped into two. And in the Seniors Final, Shaun Skilton came out on top after narrowly beating Joss Ash’s impressive 13.6 with a 14.9 combined wave score. Emily Currie continued her weekend of success with a decisive win in the Disco Bead’s Women’s Final over fellow surfer girls, Peony Knight, Lucy Campbell and Anne-Cecile Le Tallec. Congratulations to all who competed in this year’s event, and special thanks to the sponsors who supported it; Sharp’s Brewery, Cornwall College, Watergate Bay’s Extreme Academy, Fetch Surf Co, Dritek, Snugg Wetsuits, Niglon, Zumba Fitness, Checkered Photography, Fistral Beach, Extreme Academy, Disco Beads, Get Fruity, Boneyard Clothing and Red Bull. 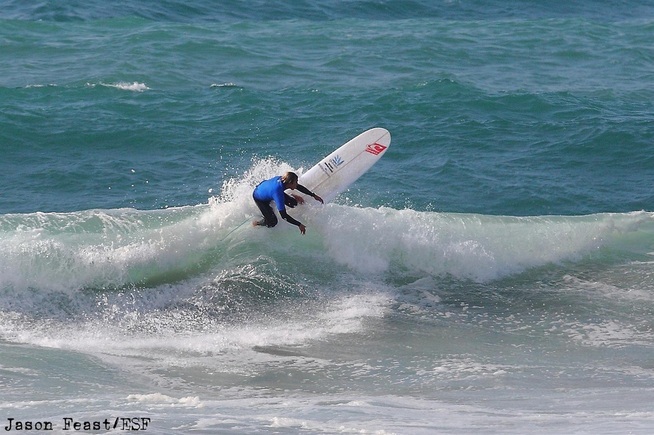 2014 Euro Junior Surfing Championships, S. Miguel, Azores. Congratulations to Keshia Eyer who put on a barnstorming performance to win the U18 Ladies European Jnr Championships. In Clean 2-3ft conditions Keshia from the off controlled the heat with her attacking style a series of gouging hacks and cutbacks suitably impressed the judges allowing her to maintain her control and lead throughout the whole 25 minute final. Congratulations also to Harry de Roth who made the U16 final, Harry gained 4th in the competition, a higher placing was not to be for him this year. An outstanding performance from Harry to progress to the grand final without dropping into the Repêchage round. Huge thanks to Dave Renaud and Kelly O'Toole for their tireless contribution binding the Squad into a stoked competitive unit. Even though the Team placed 10th overall (due to a part strngth squad) this really does not reflect the individual placings for the rest of the team members. A massive thank you to each member of the team for their contribution, thats not just in the water but the support they gave at the waters edge cheering on other team members. St Ives surfer and Birthday boy Harry de Roth has just surfed himself in the Final of the U16 European Junior Surfing Championships. The English Junior Squad have now all assembled at their contest headquarters after a gruelling day of travel to get the to the mid Atlantic group of islands of the Azores. Dave Renaud and Kelly O'Toole now have a couple of days to focus the minds of the Junior Team a range of heat drill scenarios. The Opening Ceremony and Parade will take place the morning of Sunday 14th September with the first heat of the competition starting on the Sunday afternoon. The English Surfing Federation would like to express their gratitude to SUNDRiED for the provision of the Squad Kit and to Newquay Activity Centre for their continued support towards the National Surfing Teams. Keshia Eyre qualifies for Grand final.....Huge hit hit off the lip and a score of 6.88 saw Keshia in control of the heat and progressing in 1st place. Team England now has two competitors in the Grand Finals. Harry de Roth in the U16s and Keshia Eyre in the U18 Ladies. The last day before the final day and half of your squad still in......excitement and expectations can be described as high. Keshia staretd the day off, surfing for a place in the grand final but the scoring waves never came her way and now the Repechage little final is now her route into the Grand Final. Harry de Roth next up and yeeeew!!! Harry produced the goods and with two waves with big hits off the lip impressed the judges enough to give him a place in the Grand Final. Harry is the first English Junior Finalist for many years. The u14 entered the water very much on a high, Eno James scoring with two solid rides executed with controlled style, next round beckoned, unfortunately his next heat saw him exit from the competition. Stanely Norman didn't have the best starts in his heat, taking off on a rolling A frame he unwittingly dropped in the the Swedish surfer, interference called. This put him on the back foot for the rest of the heat from which he never really recovered. Third place and another proud exit. So its Finals day today, Keshia is to surf her heat to progress to the Final and Harry has his Final mid afternoon. Check out the action at live.eurosurfing.org Cheer the team on!! Now that we have entered the the business end of the competition!! Wave selection and progressive manoeuvres count in a big way, and!! we will start to lose people. Yesterday's end of day feed from Dave came with a mixed bag of results. 'Angus was a very close call, thought what we had was an interference call but the judges let the French surfer's score stand'. So no interference called. Protest Filed... Emily Currie couldn't quite get into the scoring zone and now has a second bite in the Repêchage Event. Keshia worked solidly getting second and another progression. Late into the day Jordan Pethick bowed out of his Euro challenge. Good showing Angus and Jordan....Cheers boys!! They ran 2 U16 heats this morning, Harry placed 2 nd to progress and Angus3 rd sending himself to the next repo round! We spent the day exploring this amazing island, volcano lakes and hot waterfalls! Not sure if you are aware of the double elimination contest format. Harry has made the progression small final which is great news, Angus now moves through the repo round final stages. Good news all round for the team. Looking forward to the U18 Girls U14 boys and Jordan fighting it out in the Bodyboard. If you have been following the event on the Live Stream you will have seen that the surf has been a cauldron rippy white water peaks with no sections to work with. Despite the hideous conditions Keshia and Emily have both progressed through the 3rd proper and surfing well against their peers. Steady work from Keshia gained her rightful place in the next round. Emily did have us chewing our nails as she snatched her place into the next round in the dying moments and what was the last wave of the heat...pheeeeew!! Jordan one of our bodyboarders won his heat and progresses nicely into the next round of the repo event. We would like to say a big well done to Jo Harding who bowed out gracefully today and a thank you to Arran Strong for taking the brave decision to compete despite a recent injury. And it was an injury that also sidelined bodyboarder Josh Lewis and denying his chance to progress. Big day tomorrow as I am sure our surfers will be battling it out for places in the little final of the progression round. Keep watching the live feed and cheer the team on. Wow!! What a cracker day!! All through with some brilliant surfing from the team! The U 14s - Eno and Stan braved the big surf to place first and second respectively. The U18 Girls Keshia and Emily again placed first and second to advance. The U16s division was dominated by Harry De Roth and Angus Scotney tearing into big outside bomb waves! Tomorrow we press the reset button for the U18s Joe Harding and Arran Strong in the repos and Jordan Pethick and Josh Lewis in the U16 bodyboard! We are delighted to announce that SUNDRiED will be supporting the English Surfing Federation squad throughout 2014 and 2015 (www.sundried.com). We are excited to support the full squad, with our unique innovative designs, and range of surfing t-shirts, hoodies, sunglasses and caps. The squad will compete at the European Championships in Azores on the 13th - 21st September 2014, and will certainly be looking the part in matching SUNDRiED squad kit. SUNDRiED have designed a bespoke range especially for the European Junior Surfing Championships. Working closely with the English Surfing Federation, the team at SUNDRiED have come up with a striking and bold design for each individual athlete. Catch up on all the surfing action and the progress of the English Team at the European Junior Surfing Championships with this live link to the event: http://live.eurosurfing.org or visit their Facebook team page (www.facebook.com/englishnationalsurfingchampionships). If you’re interested in finding out more about SUNDRiED, including their range of t-shirts and accessories then visit www.sundried.com or follow the team on Facebook (www.facebook.com/sundried) and Twitter (www.twitter.com/sundried). Newquay Surfers Tom Butler and Adam Griffiths were victorious in the English National Championships in the Open and Longboard disciplines respectively. This years scaled down event didn't diminish the importance for the competitors competing for the coveted title of English Champion. Officials and competitors arrived at Watergate Bay to what could be best described as monstrous conditions. First round heats were completed but the feedback from those braving big waves dredging onto the low tide banks was not good. Sponsors of the event Extreme Academy along with the contest organisers agreed that the competitors safety was paramount and so the whole show reconvened at Tolcarne Beach. Large closing out waves were still order of the day and this still demanded that the progressing surfers had to ensure their wave selection was on form to enable themselves the opportunity to get the big manoeuvres which are then transformed into big points. First of the finals were the Longboarders and it was Newquay's Adam Griffiths who paddled into a wave that took him right across the beach and points to match, a good scoring back up wave had him comboing the four other surfers in the final. Reining Champion Ben Skinner gave chase and even with a late charge in the dying moments of the heat he failed to overhaul Adam who claimed the deserved win. The Ladies final was initially controlled by Woolacombe's Lucy Campbell, but her early dominance wained as Anne Cecile and Hannah Harding began to exchange wave for wave but it was Anne Cecile's stronger and more powerful surfing that won the day. All eyes were now on the Open Final. Large waves with workable open faces rewarded the judges and spectators alike with spectacular surfing with the heat leader changing places no less than three times. Strong surfing with progressive manoeuvres were in abundance and even being claimed by the competitors. Gordon Fontaine surfing solidly throughout the day posted two Six point rides but it was Tom Butler who on his back up wave pulled off three big turns and gave him the unassailable lead with two seven point rides. The heat drew to a close and with it Tom's second English Champion Title. English Surfing Championships 2011. Longboard Champion, Adam Griffiths.